and optoisolated inputs for connecting CNC machines to the Mach4 family of software. The PMDX-424 provides 4 Axis (5 Motor) control, 9 opto-isolated inputs, plus a 6 ampere relay output to control spindle on and off. 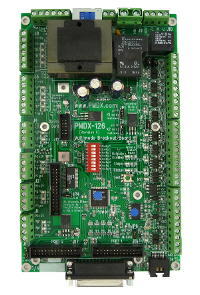 The PMDX-424 can also be used with PMDX motherboards and the PMDX-407 Spindle Controller. 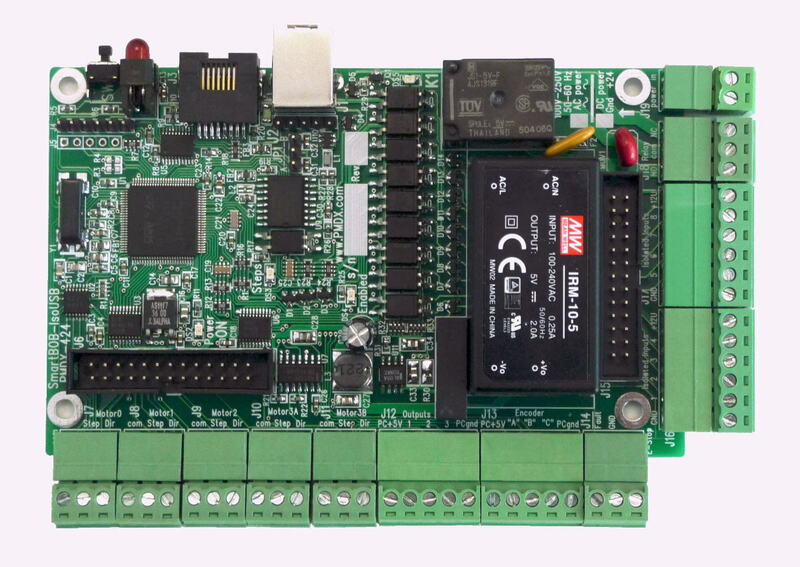 2) A single board implementing both the breakout board function AND the motion controller function saves cost and makes installation simpler. All screw terminals are pluggable terminal strips with 0.150" pitch for ease of wiring and repair. Use of option jumpers has been minimized by controlling features via software. 3) The motion control pulse engine generates pulses independent of the host computer timing and provides real time control for smooth step pulse signals up to 100 KHz on 4 axes (5 motors). Output signals are buffered with 24 mA drive at 5 volts. The "common" reference to the motor drivers is switchable to either Ground or +5 volts. One axis has special cloning circuits to provide for two sets of outputs for a gantry with two motors, including reversed direction on one motor, and provision for future implementation of suppressing the motors one at a time to allow gantry "squaring" operations. 4) The motor outputs are available as both pluggable screw terminal connectors and as a 26 pin ribbon header for use with motherboards such as the PMDX-133, PMDX-134, and others developed in the future. 5) The on board power supply can be operated from universal AC mains input of 100 to 240 VAC or an optional version accepts 12 to 36 volts DC. The PMDX-424 powers the PMDX-407 Spindle Control and can provide 12 volt DC power for NPN proximity sensors, and also 5 volt DC power for accessories such as an encoder or the PMDX-104 Relay Board. Needing multiple external power supplies to run your control system is a thing of the past. 6) The Emergency Stop and and Fault inputs are opto-isolated. The Emergency Stop input expects a normally closed path to ground. This provides failsafe operation. Any break in the circuit will signal an emergency stop. The Fault input expects a normally open signal and can accept a mechanical switch to ground, a three-wire NPN style sensor, or an open collector fault output from motor drivers. If the Fault input is driven to ground it will act the same as an Emergency Stop. 7) There are 8 opto-isolated input signals each having a pull-up resistor to +5 volts to allow use with simple mechanical switches or NPN proximity switches. These signals are filtered to reduce noise sensitivity. The inputs will also accept 5 volt logic signals. PNP proximity switches will require external adaptation using a PMDX-105 or an equivalent circuit. All inputs are protected against voltages up to 50 volts above ground. 9) Ribbon connector to support a future remote inputs motherboard as an alternative to the screw terminals. 10) The relay output provides both normally open and normally closed contacts rated for up to 6 amperes at up to 240 VAC. The normally open contacts are equipped with an arc suppression snubber for longer contact life. An LED is provided to show when the relay is activated. When the PMDX-407 Spindle Controller is used, you can wire this relay to control spindle direction if desired. 11) There are three logic level outputs that are 5 volt signals with up to 24 mA of drive current available. These signals can be used to drive solid state relays or the PMDX-104 four channel, 5 ampere relay board. 12) All outputs are turned off in the event of loss of communication from the host, or if the Emergency Stop or Fault inputs are activated. 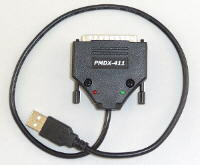 13) The PMDX proprietary RJ-45 connector is provided to support the PMDX-179 remote status panel. 14) An on board LED is provided for "Enabled" to indicate that the unit is ready to run the machine and as an aid in troubleshooting. 15) An on board LED for "Steps" is provided to indicate that motion is in process. 16) The board can be mounted against a panel with holes to allow access to the USB jack, remote panel RJ-45, pushbutton, and status LEDs. 17) The externally visible red and green status LEDs show the status of Emergency Stop, host connection and the status of the SmartBOB-IsoUSB board. 18) The externally accessible pushbutton provides for recovery from firmware download problems. 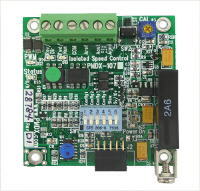 20) The PMDX-424 is a compact 3.0" by 5.0" board that fits in tight spaces. interface is available to work with the PMDX-424. PMDX-424-Bundle>> SmartBOB-IsoUSB breakout board, 110-240 VAC, bundled with Mach4 Hobby. PMDX-424-DC-Bundle>> SmartBOB-IsoUSB breakout board, 12-36 VDC, bundled with Mach4 Hobby.